The Biblia Pauperum was another of the famous block books published in many editions in Germany and the Netherlands. It rivaled the Ars Moriendi in popularity. Copies of this work were never really acquired by the poor layman, as the title of the work might suggest. In all likelihood, it was found in the hands of the poorer members of the clergy who could not afford the complete and expensive Bible. The illustrations deal with episodes from the life of Christ, some parallels from the Old Testament, and textual comments from the Prophets. The book generally consisted of some forty to fifty leaves, and in this concise form it satisfied the needs of a poor priest who sought suggestions and material for his preaching. From an artistic point of view, the crowded pages do not have the impact of the full-page illustrations of the Ars Moriendi; stylistically they are linked to the traditional handling in illuminated manuscripts dating from as early as the fourteenth century. During the late Middle Ages, the drawing of parallels between events and characters of the two Testaments had become a popular device. Each page of the Biblia Pauperum illustrates a subject from the life and Passion of Christ, two parallels from the Old Testament, and two witnesses from among Biblical personages. Thus, on the page dealing with the Resurrection of Christ, we also see the traditional parallels drawn from the narratives of Jonah and of Samson. On another page, depicting the Annunciation, the compartment to the left displays Eve in the Garden of Eden. 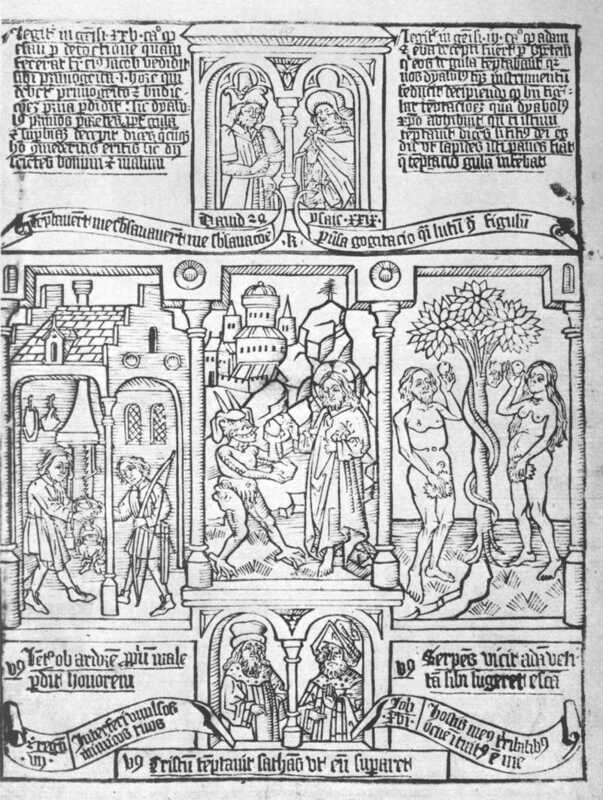 In the woodcut illustrated here, we see the Temptation of Christ in the centre panel, Jacob and Esau on the left, and the Temptation of Adam and Eve on the right. The preacher was thus left a broad choice as to what use to make of these pictures and text for his sermon.